Warmer or colder than average ocean temperatures in one part of the world can influence weather around the globe - boggles the mind, right? During normal conditions, trade winds, which blow from east to west, push warm surface waters towards Asia, piling it up in the western Pacific. In some years though, the trade winds weaken. The warm surface water moves eastward and reduces upwelling of cold water off the coast of South America. Climatologists call this El Niño. Its climate impacts show up mostly in the wintertime over North America. But eventually those trade winds pick up again and sometimes become even stronger than normal. When that happens, they blow the warm water back into the western Pacific and restart the upwelling of cool water towards the surface in the eastern Pacific. 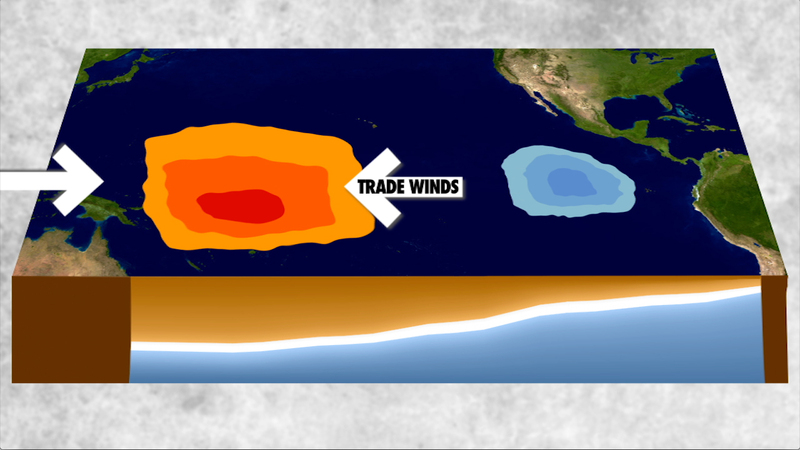 These strong trade winds are a signature of what is called La Niña, unusually cold conditions in the tropical Pacific that displace the Jet Stream northward. La Niña can lead to drought in the southern US and cooler temperatures, heavy rains and flooding in the Pacific Northwest. El Niño and La Niña together are part of a cycle that influences extreme weather and can impact food production, water supply and even human health not just in the US, but in many parts of the globe. El Niño and La Niña episodes typically last nine to 12 months, but some prolonged events may last for years. In Spanish, El Niño means The Little Boy, or Christ Child, and La Niña means The Little Girl. While their frequency can be quite irregular, El Niño and La Niña events occur on average every two to seven years.